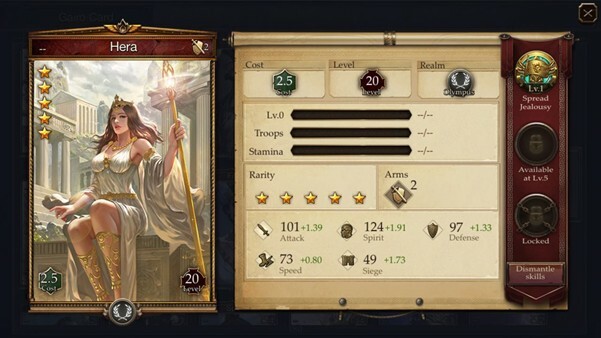 Comment For Hera, the beautiful and jealous wife of Zeus, her skill, spread jealousy, is a command type skill that does not fear control and can definitely be launched. Just look at the damage reduction and infantry attributes for the first three rounds, these are all formations that will counteract Anubis. Depending on your luck, her state in the subsequent two rounds - ballistic- can not only kill the enemy but also kill herself. For a female Gairo with a main skill plus spirit, her growth can reach 2.13, which is considered pretty good. Place her in the center together with group spirit skills and the damage will certainly be quite reasonable. In addition, her damage reduction skill also comes with spirit plus. Personally, I think that is one of the strongest Gairo for later stages, but the biggest drawback is that as an Olympian in an infantry camp, it is not easy to get a perfect grouping (the Olympian realm does not have any particularly good front-line infantry). Such a strong command skill can be trained for use if you do get this Gairo. 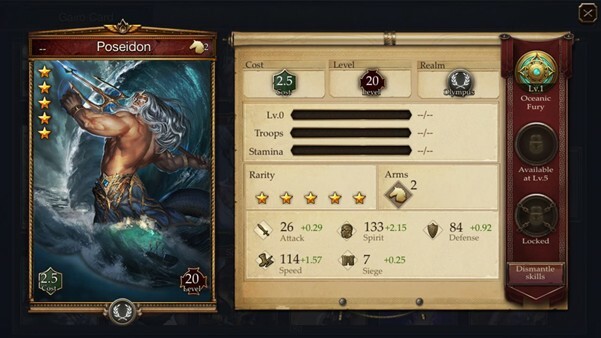 Comment Poseidon is one of the legendary Gairo that is especially easy to get during the early stages of the game. His main skill, if you are able to launch it, is probably the spirit skill with the most explosive power. This, plus the fact that he is cavalry and low cost, offers very powerful output if you are able to draw him at the early stages. Spirit flames is something which basically everybody will have and you can easily get an explosive output if you add that to Poseidon. Although his attack power is so low that it's scary, many people choose to place Poseidon directly at the rear and give up his normal attack output. Yet spirit flames is something that must be placed with the center Gairo for maximum impact, and as a rear spirit skill, incantation of death cannot be stacked with this fatal flaw, so my suggestion is Poseidon should be placed in the center to be responsible for the output. As a fast-moving spirit master with skill that can inflict very high damage, Poseidon's advantages are very obvious, but his disadvantages are just as clear. His growth is not high and there are many spirit masters with spirit growth higher than 2.15. Moreover, his attack growth and defense growth are nothing compared to many other more powerful spirit masters. Plus he is from the Olympian realm, making it even more difficult to form a grouping that offers the maximum bonus. But as a commoner's spirit master, Poseidon is still very useful as his output is really high! And most importantly, it is very easy to draw Poseidon! 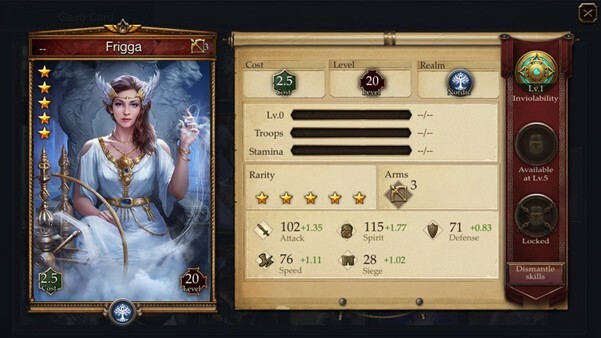 Comment As one of the three Nordic leaders with the capabilities to nullify their enemies' attacks (Frigga, Thor and Baldur), Frigga's ability to nullify active skills and reduce the damage from physical attacks is not bad. Her skill range is also good enough for the rear, and her main skill plus spirit growth can reach 2.05, which is a decent figure. Frigga is one of the best Gairo to deal with spirit masters. 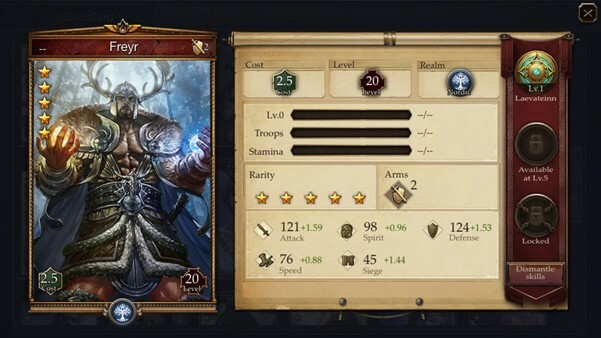 However, Nordic does not have many archer Gairo, so you may need to sacrifice a bit of bonus to group with more compatible group members (such as using Frigga to nullify active skills while Thor stops the enemies from recovery and Baldur to nullify normal attacks). Of course, such a grouping is not the only one possible. Just that there are not many skills that combine instantaneous launch + nullify active skills. Once launched, this can significantly reduce the opponents' output. My personal recommendation is that Gairo at the rear tend to perform a more supportive role, so a skill with control effects or power will be a better choice, and this is also a feasible tactic to tackle the commander. Comment I personally do not feel that Idun is a good Gairo for deployment. Firstly, her growth is weak, only 1.45 for spirit attacks. Next, her main skill has to be randomly added to someone in your army and can even be added to herself. But on the other hand, Idun's main skill is suitable for cleave attacks. There are two trains of thoughts: 1. As an auxiliary plus spirit, and grouped with a phalanx or lightning or any other output skill together with two physical output Gairo at the center and front (best is a Gairo with normal + chase skill). 2. As an output plus attack, and giving up the features that can be influenced by spirit. Configure a cleave grouping for all the troops, with front and center attacking all at once. Add chase skills to the whole group, including Idun, so that Idun's skill will be just as useful regardless who is it randomly assigned to. A 100% pure cleave attack. Although I analyze how Idun can be used, I still do not recommend her for use as the launch probability is not very high and the effect only lasts for one round. It will make more sense to dismantle Idun for the extremely powerful control skill - disturb! Comment Freyr is another legendary Gairo that can be drawn easily. The most well-known usage is to dismantle her for threaten, a skill said to be the band of cleave attack groups. As a legendary Gairo, neither of Freyr's output attack growth nor defense growth are high enough. Her main skill is not helpful for the front, and her speed is comparable to a crippled Merlin. 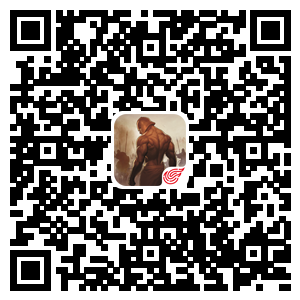 The main skill is a debuff against the enemy. It increases damage, which means that her group mates must be those with physical output. However, Gairo with good physical output often prefer auxiliary types like Sif or Odin. Freyr is really not a very attractive option. 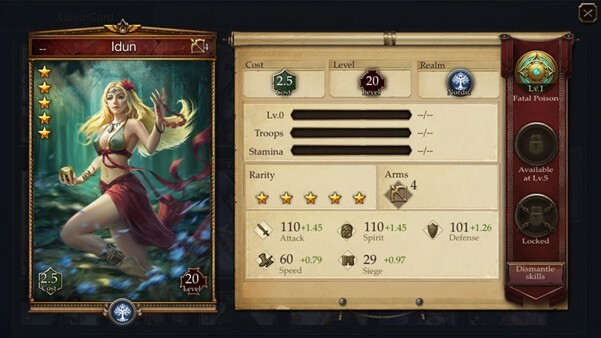 I personally think that the only bright spot is that her skill based damage is not too bad, and when you do not have any good center output, she is useful for the interim. But she is not very useful at later stages of the game. Note: This guide is provided by players and does not represent the official stance of Immortal Conquest.